Draw the input area of this field in the specified viewport. The cursor will already be positioned for you. Do not draw more than 'input_width_' characters. If the highlighted flag is passed in, the field is active, otherwise it is not. Interpret keys passed to this field by popup() as the user wants to make changes. Only some keys get to the field -- data keys, and left and right arrow keys for example, but not up and down or paging keys. An input element in a Dialog. 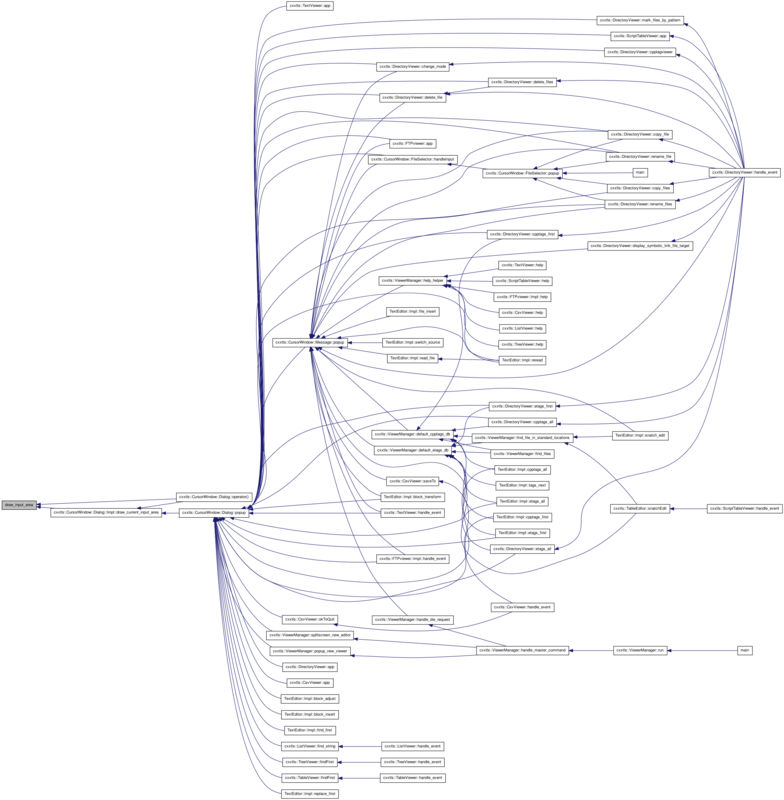 This is an abstract base class from which you can derive -- although there are some builtins (Ok,string, etc). The popup() function will handle some keys and some will be sent to the element's handle_key method. The draw() method may be invoked multiples times within the popup() function call. The popup() function draws the labels and the dialog title. 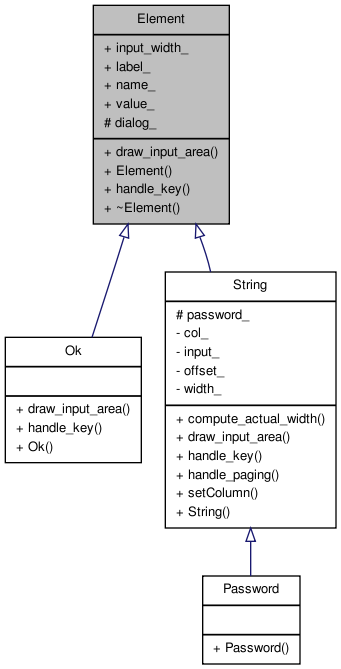 The element is responsible for drawing its input area -- but not violate the input_width_ which may not be the same as what is specified during the element's construction. the popup() function handles keyboard input and distributes some keys to the element's handle_key function: data keys and left and right arrows but no other keys -- except key_dc. Definition at line 1126 of file cursorwindow.h. Definition at line 1178 of file cursorwindow.h. Definition at line 1186 of file cursorwindow.h. Implemented in Ok, and String. Definition at line 1169 of file cursorwindow.h. Definition at line 1166 of file cursorwindow.h. Definition at line 1176 of file cursorwindow.h. Definition at line 1174 of file cursorwindow.h. Definition at line 1173 of file cursorwindow.h. Definition at line 1175 of file cursorwindow.h.